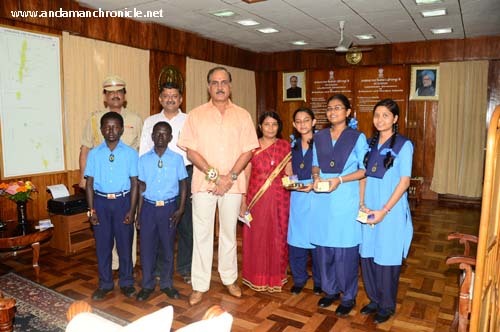 Port Blair, Aug. 21: The Lt Governor, Lt Gen (Retd) A. K. Singh, PVSM, AVSM, SM, VSM celebrated Raksha Bandhan with children of Vivekananda Kendra Vidyalaya, who tied rakhis to him. The Lt Governor blessed them and extended his best wishes to all of them. Sweets were also distributed to the Children. Sisters from Prajapita Brahma Kumaris also tied rakis to the Lt Governor and extended their best wishes for a long life.